It’s the end of Event #6 of the Full Tilt Online Poker Series which takes place on the famous Full Tilt Poker online poker room. 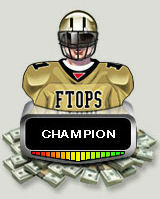 It saw 642 players pay the $500+$35 entry fee for the chance at winning the $75,000 first place prize money. You ask what style tournament they were playing? They were playing the ever growing in popularity Pot Limit Omaha 6-max tournament. The tournament did attract a healthy amount of players, but unfortunately it fell just short of a guaranteed prize pool of $350,000. One thing I need to note on is the impressive tournament results of Full tilt Poker pro Aaron Bartley who has put in some deep runs in the Full Tilt Online Poker Series so far and he even finished 24th in this event. Below is a complete list of competitors and the results.